Having explored the Balance Sheet in the previous article, we will now look into the other important Financial Statement- the Income Statement. We will see what the Income Statement is, why the “Bottom-line” in a company is significant and what to take into consideration while reading the Income Statement. The Income Statement presents a summary of a firm’s operations for a given period of time, generally, one financial year. It is also called Profit and Loss Statement or Statement of Earnings. It is a record of the revenue and expenses of a business and the net result, i.e., Profit or Loss. The Income Statement contains four major items, viz., Revenues, Expenses, Profit and Loss. Revenue is the amount earned through the sale of goods and services by normal business activities. It is also referred to as Sales or Turnover. Expenses are the amount incurred to operate the business. For example, the cost of inventory, spending on advertisement, salary of employees are all expenses. Profit occurs when revenue exceeds expenses and Loss occurs when expenses are greater than revenue. Depending upon the nature of expenses deducted from revenue, Profits could be Operating Profit, Gross Profit, Net Profit, etc. These different terms are important in analysis and are taken up further in the article. 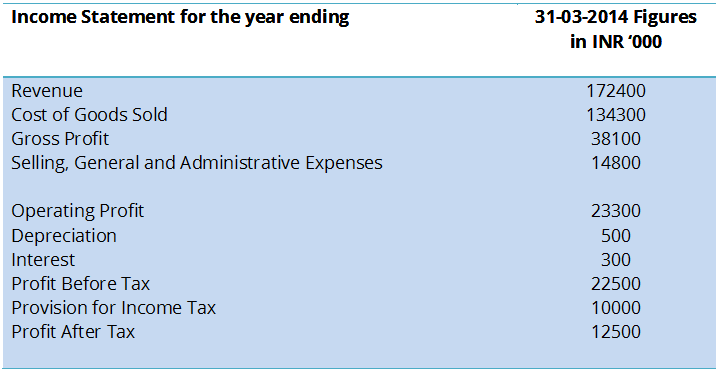 A sample Income Statement is presented below. The Cost of Goods Sold (COGS) reflects the cost of the inventory the business has sold to its customers. This will include cost of raw material, inventory, warehouse, etc. The difference between the Revenue and COGS is called the Gross Profit. Gross profit can be used to measure how well the company is able to deal with its variable costs, cost of labor, raw material, shipping and transportation, etc. Gross profit is, thus, an important indicator of a company’s production efficiency. The Selling, General and Administrative Expenses (SG & A) represent the cost the company incurs in marketing, advertising, commissions, salaries, accounting and auditing cost, rent, office expenses, insurance, etc. Operating profit is arrived at by deducting the SG & A from the Gross Profit. It is also called Earnings before Interest Tax Depreciation and Amortization (EBITDA). The Operating Profit is the primary indicator of the management efficiency in operations, and is compared with peers to get a better understanding of the operational efficiency of the company. Depreciation represents the diminution of the value of an asset due to use, wear and tear, etc. It is the allocation of cost of an asset over its life. Depreciation is charged on fixed assets. Amortization is likewise charged on intangible assets like patent, copyright, etc. Depreciation and Amortization are not exactly running expense to the company as there is no cash outflow from the company. Interest represents the amount the company has to pay to its lenders as a cost of borrowing money. Taxes are imposed by the government and are payable to State and Centre Government. After deducting the Depreciation, Amortization, Interest and Tax, we get the Net Profit of the company. It is also called the Profit after Tax (PAT), Earnings after Tax (EAT) or simple the Bottom Line. It is the most important measure of the profitability of the company. It represents the increase in net assets from all the profit making activities of the company, and is widely used by investors, analysts and others. Apart from the above mentioned heads, there may be some Non-Operating Income, which represents income from other than operations of the company and includes income from the sale of assets, investments, currency, etc. There may also be some Extraordinary Items which represent profit or loss that do not occur in the usual course and are infrequent. It may include loss from fire, write down from sell off, etc. The Income Statement is used for different analysis. Investors are concerned with the Net Income or Profit after Tax, which will either result in a dividend payout or cash flows to enable growth of the company. Income statement is used to derive profitability, which is also a key concern for the lenders as a firm’s ability to pay principal and interest will depend upon its profitability. Revenue growth is a measure of the firm’s ability to expand its market. Operating income reflects the manager’s performance in conducting operations. Managers can also derive conclusions regarding the company’s pricing strategy and cost-cutting initiatives through the Income Statement. Revenue recognition is somewhat on the discretion of the management and they may be inclined to report revenue earlier, say, in case of an ongoing project instead of as a percentage of the project completed. The way a company values its Inventory will affect its Expenses. The method it uses to charge Depreciation on its assets can affect its Profit Before Tax. Hence, these will have a significant impact on the Income Statement of the company. As different companies may have different methods for the same a comparison among peers or across industries will require an understanding of these methods and a suitable adjustment to make them comparable. In a nutshell, the accounting policies put in place by the management may be very conservative or aggressive in reporting the expenses. Thus, in an aggressive company, earlier Revenue recognition and delayed Expense recognition will increase the net income of the company. Therefore, while the Income Statement is a key financial statement for analysis, the users have to be careful in dealing with the estimates and the methods of revenue and expense recognition. The reasons for the estimates and methods used should be properly scrutinized and taken in to account. This is especially important while comparing with peers and benchmarking as different companies in the same industry may have significantly different policies. In the next article of the series, we will take up the Statement of Cash Flow.